Home > America Muscle Car > Car Concept > News > Chris Forsberg's 1972 Sr20det swapped Datsun 510 Wagon! Chris Forsberg's 1972 Sr20det swapped Datsun 510 Wagon! Chris Forsberg took his wife's Datsun 'grocery' car and turned it into something that would break the internet as it rolled out of a SEMA Show in Vegas.That engine bay is sooo clean an we love the black and carbon theme too. Wearing SSR MkIIIs, a Hakosuka-style nose and some odd-looking box flares, it was said to be a companion to his Datsun 280Z. It had a Mazworx SR20DET under the hood, fully adjustable suspension, and four-wheel disc brakes. The project was a quick build, taking something like two weeks. 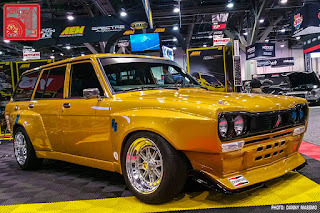 Chris Forsber SR20DET Datsun 510 Wagon at SEMA!